Dog Friendly Places in Perth. The Lodge At Perth Racecourse opened in July 2016 as a 26 bedroom budget hotel with a bar and dining room, and has built up an enthusiastic following due to the reasonable prices along with the comfortable rooms, great food and really genuine service. All the staff are dog lovers, the owner has 4 Labradors! Dogs are genuinely welcome. 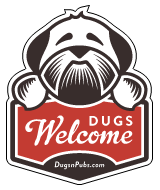 Dogs stay free of charge and are allowed to join their owners in the bar including during mealtimes. The Cherrybank Inn is a family owned Perth Inn situated on the Glasgow Road. Pitcairngeen Inn is a small country pub offering more than your average country fayre. Our snug and lounge offers a daily menu of local, fresh and seasonal food using some of Perthshire finest produce. We use local suppliers and this includes our real ales and ciders and extensive range of malts. There are a total of 24 dog friendly listings in the Perth category. Please log in, or sign up as a member to view all listings.